Now part of a weekend of running events that features a full, 26.2-mile marathon in addition to the 13.1-mile half marathon as well as a 5K and 40- and 60-mile bike races, the Charleston Marathon makes its 10th annual running in 2020 here in the “Holy City,” known for the number of prominent churches throughout its downtown, which has few tall buildings of any kind. If you’ve ever visited the city, you’ll recognize Charleston as one of the nation’s truly unique urban experiences, on a par with a visit to cities like New Orleans or Boston — the city combines many of the charms of those two cities, in fact, meshing the southern charm and ambiance of the Big Easy with many of the architectural accents and styles of New England cities like Boston. Runners will get to see many of the local landmarks and sights that give Charleston its southern beauty and charming style along the half marathon route, which follows a point-to-point course that starts in downtown Charleston near the area known as “south of Broad,” and takes runners through the city as well as the North Charleston area before heading in to the finish line at Riverfront Park. While the course map shows that there are indeed some rolling hills to be found along the course, runners should experience overall a very flat and fast race, as Charleston lies near the coast and so itself is very flat throughout the city. 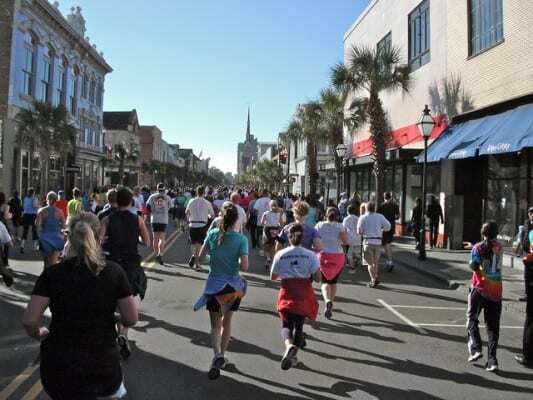 One thing to note is that unlike many larger city races, the streets in Charleston can be fairly narrow — especially along the stretches that bring runners through the city’s downtown and historic districts — so you’ll want to run with care through these areas, as spectators are likely to be found here. The half marathon also is open to runners and walkers, though the full marathon is open to runners only. The event also is a fundraiser for the locally-based Youth Endowment for the Arts, which works to provide access to the arts experiences to all Charleston-area children — and you’ll notice when you’re in the city what a huge part of life the arts is here, from the galleries along King and Queen Streets downtown to the annual Spoleto arts festival the city holds each spring. More than 4,500 runners crossed the finish line in the full marathon, half marathon and 5K combined at the race’s 2016 running. Nestled along the west bank of the Ashley River on the South Carolina coast, about two hours’ drive southeast from Columbia, the city of Charleston typically experiences its coldest weather of the year on average in January, when the city’s average monthly temperatures range between 42°F and 57°F. On the day of the race (Jan. 11), the average low is 42°F and the average high is 57°F, while precipitation amounts average just over 3.6 inches for the month. See the Charleston Half Marathon course map here. To reserve your spot in the winter 2020 running of the Charleston Marathon, Half Marathon, Shrimp & Grits 5K or Bike Ride, register online at the event website here. Ever run in the Charleston Half Marathon? Share your impressions here, or post your review in the Comments box below. I am curious to know further information about being a vendor at the Charleston Marathon Expo. How much would a 10×10 space cost, and if there would be any other fees?